Every Friday through the summer months, we’ll be taking over the Arnolfini quay with lip-smackingly good street food alongside DJs and live bands in Bristol’s favourite sun trap. See out the working week with fine libations courtesy of the ale aficionados at Bristol Beer Factory or from the Buoy gin bar with a carefully concocted menu designed by the award-winning Bristol Dry Gin Micro Distillery. Turbo Island Iced Teas anyone? Each week, there’ll be a changing cast of Bristol’s sharpest street food traders — from steamed Tibetan dumplings and Japanese soul food, vegan jackfruit tacos or barbecued jerk chicken. Keep an eye on Facebook to see who’s cooking quayside and for event updates. Kick back with a sundowner and drink in the summer vibe. 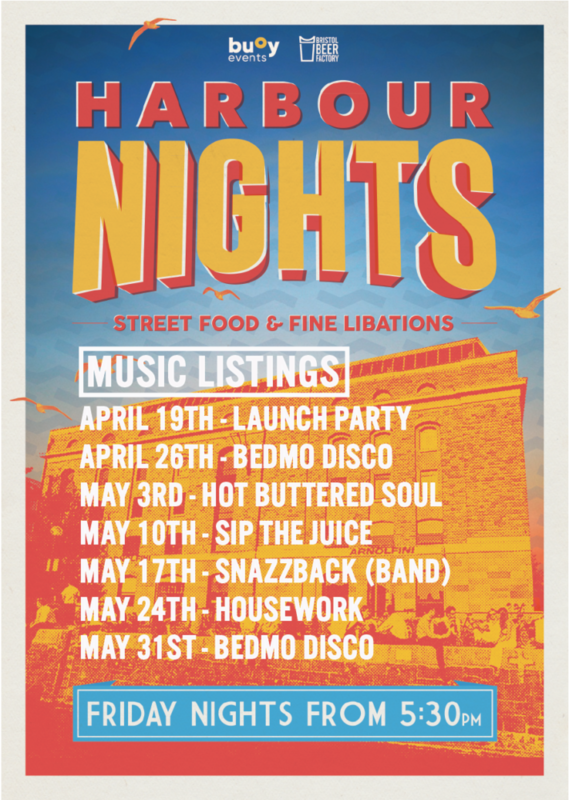 An open-air night market, Harbour Nights is a collaboration between buoy, Bristol Beer Factory and the Arnolfini.